Graham Holmberg and Kristan Clever claim victory at the CrossFit Games. With fans cheering in the California sunshine, an exhausted Graham Holmberg and Kristan Clever were crowned the champions of the 2010 CrossFit Games on July 19 at the Home Depot Center in Carson, Calif.
For Clever, it was a dominant performance and an improvement on a fourth-place finish in 2009. Holmberg, who finished 19th in 2009, used a steady performance and two big event wins to bring the Fittest Man on Earth title back to the United States. 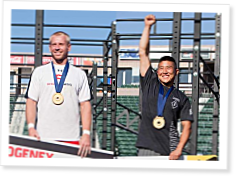 The newly crowned champions give their thoughts on the 2010 CrossFit Games in these exclusive interviews conducted shortly after the awards ceremony. In this collection of great moments from the 2010 CrossFit Games, Mike Warkentin shares some of the stories that made the Games a truly special event. Mike Warkentin talks to the organizers of the Central Canada Sectional and shares some of the best moments from Edmonton. Adrian Bozman and Chuck Carswell talk about the finer points of judging the CrossFit Games. Let me be the first, and so far only, to say congrats to both of you. Its a sad day when it takes almost two weeks for this to be on the Journal when last year's was up almost immediately. Kris and Graham you guys did fantastic! Wow.... Glad to see the "Fittest on Earth" are getting tons of support form the community. Great article, congratulations to the both you of. You two are truly an inspiration to train harder!